Gaby Hoffmann is many things. An Emmy-nominated actress on Amazon Prime's Transparent. A former child star of movies like Field of Dreams and Sleepless in Seattle. A Bard College graduate. A trained doula (though she no longer practices). However, one thing Hoffmann is most certainly not is shy. That's why it's not surprising to hear her preach the gospel of Bernie Sanders. 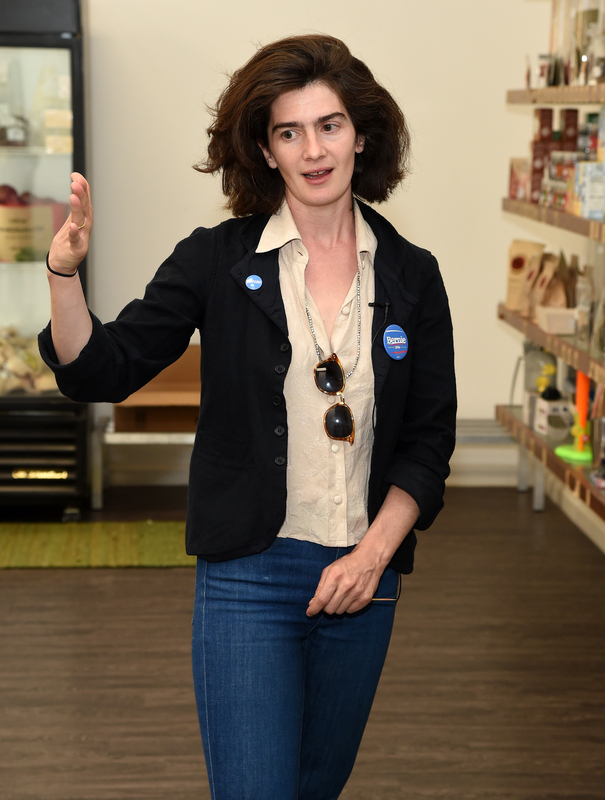 Hoffmann has hit the trail for Sanders, stumping for the Vermont senator all over the country. Hoffmann, her boyfriend, and her toddler daughter traveled to Iowa in January for Sanders' campaign. The next month, she attended the Nevada caucus to stump for the candidate, though her political activism isn't devoted exclusively to his campaign. Earlier this month, Hoffmann joined the Democracy Spring march in Philadelphia. Democracy Spring's participants subsequently marched to Washington, D.C. to "draw attention to our corrupt campaign finance system and rigged voting laws," according to organizing group the Progressive Change Campaign Committee (PCCC). Hundreds staged a sit-in on the U.S. Capitol and were arrested. In short, Hoffmann has racked up some significant progressive credentials. But when we meet in a coffee shop in Brooklyn two weeks before the New York primary, I am still a little surprised that Hoffmann bluntly rebukes any notion that feminists should feel obligated to support Hillary Clinton. Specifically, she says that she has no patience for Gloria Steinem's now-infamous "the boys are with Bernie" comment. "I think that what Steinem said is beyond stupid," Hoffmann tells me, though she almost immediately adds: "She has spent a lifetime doing and saying incredibly important things for women. She said a stupid thing once, and I don't hold her to it." The fracas over the comment made by arguably the most iconic living American feminist began when Steinem appeared on HBO's Real Time with Bill Maher. When asked by Maher why younger women were supporting Sanders over Clinton, Steinem responded, "When you're young, you're thinking 'Where are the boys?' The boys are with Bernie." Cue the outrage from young feminists — including Hoffmann. She tells me she was "totally offended by it" because "I’m a 34-year-old mother who has a pretty cute boy already, and have for a decade. I’m not looking to flirt. I’m looking to have a world for my daughter to grow up in, and that the rest of the people on this planet can hopefully have clean water to drink and air to breathe. I don’t give a f*ck about flirting with boys, so I was deeply offended." Steinem quickly apologized. Two days after the show aired, Steinem posted on her Facebook page that she "misspoke" and praised young women: "Whether they gravitate to Bernie or Hillary, young women are activist and feminist in greater numbers than ever before." Hoffmann says that she's actually grateful, in a way, that Steinem said what she did. "When it comes to Gloria Steinem, who I’ve only known to be an incredibly progressive and well-intentioned person who has done amazing things her whole life, I think it was an interesting slip," Hoffmann says. "I almost felt it was an unconscious slip to draw attention to the absurdity of the notion." In fact, Hoffmann tells me that in many ways, Steinem's remark created a dialogue that allowed women to articulate and exercise what feminism means to them. "I think it was really great and brought this conversation to the forefront and had women really challenging this notion. ‘Wait a minute? Isn't feminism about giving me a voice, and the choice to look at two individuals as people and look at the choices they’ve made and the things that they’ve said and make a choice based on that, rather than their gender? Isn’t that what feminism is supposed to be about?'" Hoffmann is also quick to bring up the ultimate counter-example to the line of thinking that feminists should feel compelled to support female politicians for the sake of seeing more women in power: the infamous "rock 'n' rollers and holy rollers" former governor of Alaska. "I mean, nobody was saying we should be supporting Sarah Palin," Hoffmann says — or, for that matter, Carly Fiorina when she was running for the Republican nomination — before quickly adding, "And I’m not comparing Hillary Clinton to Sarah Palin. But if you’re going to make an argument that is boiled down to something that simple, then you could apply it to any woman, right?" As not only an outspoken feminist but an iconic millennial actress, Hoffmann might be the ultimate example of how Sanders, an old white guy, has managed to woo many young feminists. According to a USA Today / Rock the Vote poll from March, Sanders beat Clinton roughly 2-to-1 with millennial women. Hoffmann joins other feminist celebrities, including comedian Sarah Silverman, who feel Sanders is the best candidate. In a video Silverman made for Sanders' presidential run, she said "I'm not against Hillary. I just ... I met someone I have more in common with, and his name is Bernie Sanders." It can't be said that Hoffmann held that same initial support for Clinton. It's clear that Hoffmann's connection to Sanders is more than bandwagon feeling the Bern. She says she's had trouble supporting Clinton for over a decade. As then-senator of New York, Clinton voted to authorize using U.S. military force in Iraq. "The Iraq War vote, that was probably when I really started paying attention to Hillary, because I was shocked. I was 19 years old, and I knew it was a bad idea," she says recalling her time at Bard College and later her protesting of the Iraq War. "That’s when I started feeling really concerned about Hillary." Specifically, Hoffmann says she simply doesn't trust Clinton. "I think it's no secret that she is not trustworthy. I think it's like 57 percent of America doesn’t think think she's trustworthy." That depends on which poll you choose, but there are plenty of surveys out there to support Hoffmann's claim. In fact, a Quinnipiac University poll from February found that when asked if Hillary Clinton was trustworthy, 67 percent of U.S. voters surveyed responded "no." I bring up that perhaps Clinton's reputation of untrustworthiness is a reflection of sexism in the coverage of her and her career. More than a fair share of ink has been spilled (and breath expelled) to argue that Clinton is held to a different standard by the media and by voters because she is a woman. Are the responses to Benghazi or her ongoing email scandal — or the general impression that she's disingenuous — a reflection of some insidious and subtle (or not-so-subtle) extra layer of negative scrutiny toward a woman in power, as some Clinton supporters have suggested? Hoffmann's Girls co-star (and devout Clinton endorser) Lena Dunham has called the Clinton coverage "rabidly sexist." "Oh sure, there's plenty of sexist and misogynistic language thrown around, and that’s real. In no way do I think we’re in a post-sexist moment. It’s definitely out there, and the language that’s used to talk about her is disgusting and misogynistic," Hoffmann responds. "But just because that’s true doesn’t mean that she gets a pass from me. It’s both true that she is treated unfairly and that I don't trust her." "To me, Bernie is more of a feminist than Hillary." Of course, Hoffmann is hardly the first to make this argument. After all, many Sanders supporters are quick to point out that, like Clinton, the Vermont senator has a 100 percent approval rating from NARAL Pro-Choice America and Planned Parenthood Action Fund's voting record (though both groups endorsed Clinton). Hoffmann says that Sanders better fulfills her ideals for a feminist presidential candidate, "Women are disproportionately affected by all these things [the Sanders campaign] talk[s] about, and Hillary Clinton’s record and policies don’t do as much. She’s not presenting the same version of America that I think would help millions — and not just women, but also their children (boys and girls), their husbands, their war vet fathers, their brothers and sisters. I don't understand feminism that doesn't include creating a world where we're all better off, because that means that all women are better off." While Sanders and Clinton have similar views on not only abortion, but also paid family leave and passing the Paycheck Fairness Act, Hoffmann is not alone in arguing that Sanders would be a better president for women. Many Sanders supporters argue that he would better for women because he backs raising the federal minimum wage to $15 an hour, while Clinton initially supported a raise to only $12 an hour. (Clinton has since stated that she'd sign a bill raising the federal minimum wage to $15, but with caveats, and her website still states a $12 raise for the federal minimum wage.) Since two-thirds of minimum wage workers are women, raising that minimum is often framed as a feminist issue, since it will disproportionately affect women. And while Hoffmann understands that there is certainly value in having a female commander-in-chief, she doesn't think that's sufficient for supporting Clinton: "It’s illogical to me. How can having a woman as president, that symbolism, be more powerful than having millions of lives made better for generations to come, if not the future of the world?" Hoffmann adds that she very much looks forward to the day when America has a female president, but she's not willing to compromise that vision with a woman who is the wrong candidate to her: "There’s nothing I would love to see more than a woman president of the United States of America ... I think it’s much more important that we have a progressive right now." And what about a more progressive female candidate? "If Elizabeth Warren were running, that would be a different story."